Both of these homes are on Hazelwood Road. Both are for sale. That is where the similarities end. One is a two-bedroom, ground floor flat, which the estate agent says offers an opportunity for the buyer to give it "the love it deserves". The other is a four-bedroom, detached family home with a conservatory at the back and an integral garage. 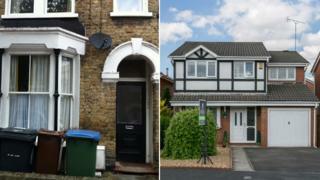 The difference in the price tags of these property siblings is about £85,000. Only when you discover that the flat on the left is on Hazelwood Road, east London, and the house on the right is on Hazelwood Road, Wigan, does it become clear which is actually the more expensive. They are an example of the regional variations in the UK housing market, not only in terms of price but also of the social implications that may result. The latest official house price figures from the Office for National Statistics (ONS) showed property values had increased by 8% in the UK in the year to the end of March. But they mirrored the view of many commentators that there is a housing market in London, and another one everywhere else. In London, prices rose by 17% annually. In north-west England, they were up by 3.1%. The Land Registry also recorded a 17% year-on-year price rise in London. Such increases proved a temptation for the owner of the Hazelwood Road property in Walthamstow, east London. She says "the price is right" to sell the property at an asking price of £325,000. She bought it for £140,000 in 2002. "Lots of people want to buy in this area now," she says. That demand, alongside a lack of homes on the market and low mortgage rates, has led to a market in London that many have described as overheating. Graham Beale, chief executive of the Nationwide Building Society, says there will soon be a "natural correction" in house prices in London - although there is little sign of it as yet. "What we will see over the next year is the big difference in house prices in London and elsewhere will narrow considerably as prices elsewhere begin to pick up," he says. Andrew Regan, of Regan and Hallworth estate agents, is marketing the four-bedroom home in Hazelwood Road, on the Whitley estate in Wigan, with an asking price of £239,950. The housing market in the area, he says, is "vibrant and balanced" but the hue and cry over a property bubble is not helping. "We are experiencing modest house price growth. We also have plenty of new-build developments either being built or about to start. I would say that, at present in the Wigan area, the balance is just right for sustainable growth," he says. "It can be a tad frustrating when we see customers who say they are being told prices are going up and up and there is a bubble." Activity is picking up, he says, pointing out that he has put 18% more properties on the market now than at this time last year. He accepts that they might start to test the market - shorthand for adding a little more to asking prices - but says that property values remain below their 2007 peak. The key for most mortgage borrowers is affordability. In Wigan, the cost of a mortgage is less than the cost of renting for most people, according to Mr Regan, and that is encouraging buyers to take a look. The Help to Buy scheme had also led to some first-time buyers showing more of an interest. This type of buyer has little in savings, but can afford to make mortgage repayments. But in London, average incomes are not rising at anything like the rate that house prices are going up. If that continues, academics say there could be significant social implications. "There is a mobility issue [for workers]," says Bill Davies, research fellow at centre-left think tank IPPR North. "It is a huge headache for key workers. Allowances will have to take this into account if the government does not act on supply." He questions the ability of the housing market in London to correct itself if properties are seen as an investment, rather than somewhere to live. These homes could lie empty or only be used for part of the year, effectively putting a further squeeze on supply. This is a particular problem in the UK, says Kath Scanlon, research fellow at the London School of Economics, because so much economic activity is centralised in London. In the US, she says, it is different with centres of government in Washington, of commerce in New York and of technology in San Francisco. The housing stock in London may also be skewed towards brand new apartments which are more likely to attract overseas investors than families looking for somewhere to live with a garden. And if young first-time buyers are being priced out of the market, she says, then their parents are less likely to sell the family home, thinking that their 20-something children might move back in while they save for their first property. All of this will restrict supply. And it is the lack of supply that most commentators and economists say is the reason for rising house prices.